Here are my thoughts about films, life, and what not. If you don't like them I'll give your money back. Okay, I admit it. I've been beyond lazy when it comes to running. 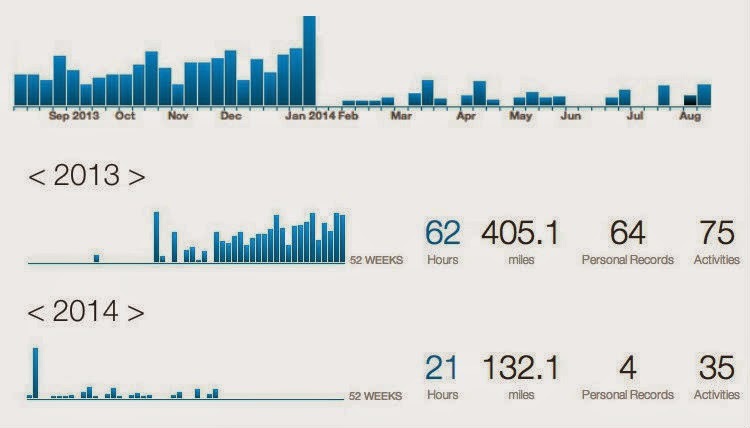 Looking at my Strava Run data is a little embarrassing. If you look at the end of 2013 vs the beginning of 2014 you'll quickly see the visual difference. If you drill on on this year you will see that in January I ran a total of 46 miles (having a 39 mile race helped), but since then I've only run 85 miles. It took me 7 months to run slight twice as much as I ran in one month (over 4 runs). Time to get back into training for something. I am looking to do a marathon in Nov. Anyone want to join? Eyeing Philly or OBX, but willing to travel. Who's in or has suggestions of a good race? Our fine arts were developed, their types and uses were established, in times very different from the present, by men whose power of action upon things was insignificant in comparison with ours. But the amazing growth of our techniques, the adaptability and precision they have attained, the ideas and habits they are creating, make it a certainty that profound changes are impending in the ancient craft of the Beautiful. In all the arts there is a physical component which can no longer be considered or treated as it used to be, which cannot remain unaffected by our modern knowledge and power. For the last twenty years neither matter nor space nor time has been what it was from time immemorial. We must expect great innovations to transform the entire technique of the arts, thereby affecting artistic invention itself and perhaps even bringing about an amazing change in our very notion of art. Opening quote to Walter Benjamin's "Art in the Age of Mechanical Reproduction" essay.